What Foods Are High In Vitamin B17? In an earlier blog published by Primo Health Technologies, the founder of B17USA.org, we discussed just exactly what the B17 supplement is and where it comes from. In that piece, we briefly touched on some of the B17 foods you can use as a naturally occurring source of the supplement, but today we will dive in a little deeper and look at some more detailed information on that topic. If you aren’t a fan of the foods below, they are out of season, or you just plain old have a hard time getting them where you live, don’t worry — Primo Health Technologies has you covered. We sell domestically made B17 500mg capsules in a variety of quantities and even offer wholesale pricing for distributors or for those who prefer to save by buying in bulk. Shop our online store for the best prices on vitamin B17 today. Even though buying B17 capsules from Primo Health Technologies is an easy, affordable way to get this important supplement into your diet, there are lots of naturally occurring foods that contain measurable levels of B17. Below, we will examine some of the varieties of B17 foods that are not too hard to come by and can help you have a better quality of life. For a more comprehensive list of B17 foods, visit our website. Seeds are a fantastic place to find organic B17 in a natural state. The seeds of most stone fruits and some other types of fruits including apples, plums, and pears are excellent places to locate this incredible dietary supplement. At Primo Health Technologies, we source our B17 directly from American grown apricot kernels. Breaking down some of these seeds at home to make them more easily consumable can be a bit of a challenge. Berries — especially wild berries or ones straight from the vine — are also an excellent source for picking up the extra B17 supplement you are looking for in your diet. Although many varieties of berries contain some level of naturally occurring, organic B17, the ones we recommend the most are elderberries, strawberries, blueberries, and blackberries. If you can get these locally from an actual farm or grower, that is best. 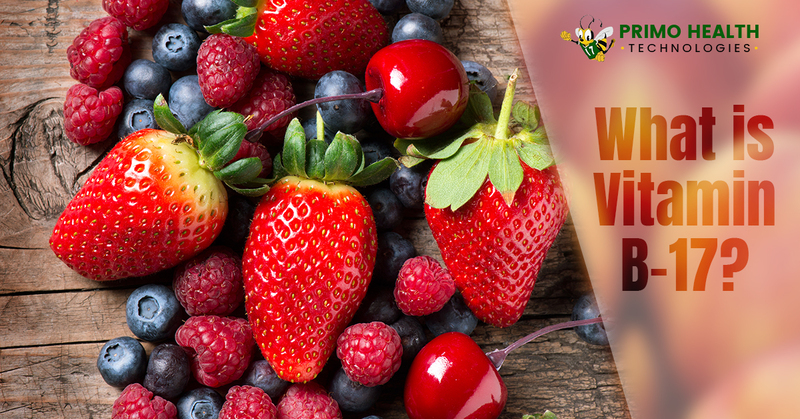 Berries actually begin to consume their own nutrients to stay alive the moment they are picked, so store-bought berries may not be quite as great for you as advertised. When local, fresh produce is unavailable, frozen berries that can be blended into drinks of thawed when ready for use are the next best choice. With the holidays approaching, another great place to find readily available vitamin B17 is in nuts that are common to western holiday spreads. Macadamia nuts and cashews are both terrific sources of the B17 supplement, although bitter almonds are by far and away the best. Best of all is that these dry goods are typically available all year round, store well, and last for a long time, making them an ideal way to get more B17 into your diet. In addition to easy to find, easy to store B17 foods like nuts, many grains also contain B17. Sorghum, buckwheat, and millet all have measurable levels and are becoming more and more common as people shift towards healthier lifestyles that involve preparing and making more of their own food. Add these grains into your diet to get the B17 supplement boost you are looking for. Certain types of sprouts also have high levels of organic B17 in them. Bamboo sprouts are maybe the most common and saturated sprout when it comes to the B17 supplement. These are a mainstay ingredient in many Asian foods and are not hard to prepare or add into your Asian inspired dishes at home. At Primo Health Technologies, we want to spread the good word about B17 supplements and empower people to add them to their lives. Whether you do that through a focused, dedicated change in diet, or choose to purchase B17 pills from a reputable, organic distributor like Primo Health Technologies is really just a choice of what fits your lifestyle best. If you do want to find B17 for sale online, check out our online store for unbeatable pricing and bulk discount offers. Be well. ©2018 Primo Health Technologies - Do not copy mockup. All rights reserved.